Over the last couple of days, towards sunrise and sunset, our skies have contained something that I never really hoped to see, because it was so rare: a phenomenon known as nacreous clouds. This morning, from our front windows, we were gazing at a kaleidoscope of colour, obviously very high in the atmosphere, dazzlingly brilliant. These clouds have been sighted all over Scotland, and social media are buzzing with them. Nacreous clouds form in the stratosphere, between nine and 16 miles above the Earth, at temperatures of around -85ºC. They are composed of ice particles which are of a consistent size throughout, dispersing rays of sunlight into a spectrum of colour through diffraction and interference. They are usually only seen over high latitudes, during the winter. This is in contrast to noctilucent clouds, which occur around midsummer, and form much higher in the atmosphere – in the mesopause, between 50 and 53 miles above the Earth. There’s a downside to their beauty, however. 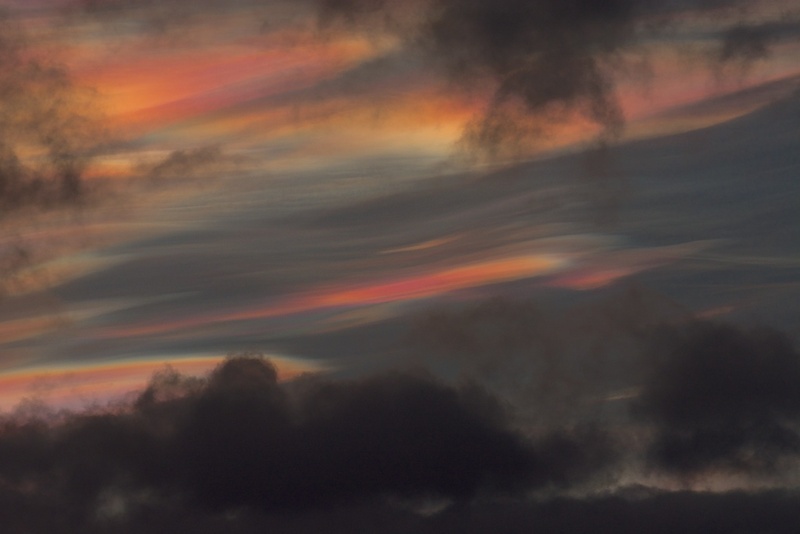 The website Atoptics says that nacreous clouds are signs of the destruction of ozone over the Antarctic and Arctic: “Their surfaces act as catalysts which convert more benign forms of man-made chlorine into active free radicals (e.g. CIO, chlorine monoxide).” Through a series of chain reactions, these radicals destroy ozone molecules. You could tell how high the clouds were because of their relatively unchanging position against the much lower, dark rainclouds that were scudding across from the west. Some had a beautiful rippled effect, while others were slowly expanding into the thinnest layers of pearlescent white. The colours ranged from gold, through mauve and pink to brilliant turquoise and green. For a time they were so bright that they dazzled your eyes. Despite their obvious warning, I have never seen anything so beautiful in the sky. Wow. How lucky to see that! Gorgeous clouds. At the moment, all we’re seeing for days on end is dreary grey. I know, Viv, it has felt the same here, although these certainly brightened us up! Amazing phenomenon beautifully captured and explained. Wow! Thank you, Jessica! 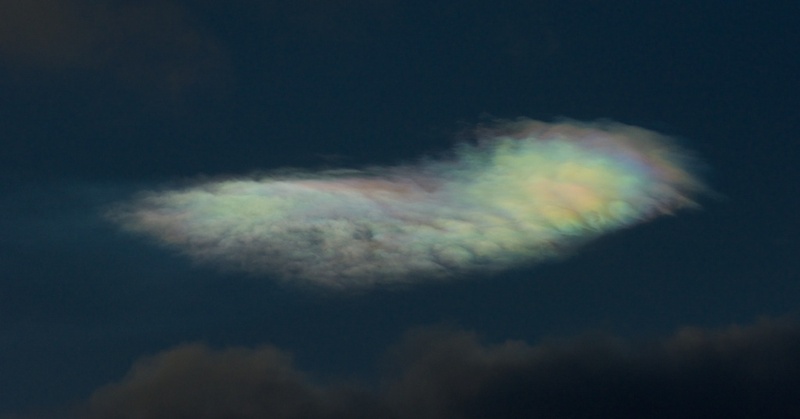 I was interested to read that there are two types of nacreous clouds – Type I are not quite so brilliant, composed of liquid droplets, while Type II are the brilliant ones. Yesterday’s were certainly not as bright, so we may in fact have seen both. Absolutely stunning. My parents also saw these clouds over Lancashire last night and said they were spectacular. I know, they were fabulous! It’s good to hear that lots of people have seen them, over such a wide area as well. Lucky you…we haven’t caught them yet….keep getting calls from friends which only makes us more jealous!!! We’ve just been really lucky, David – although I wasn’t that pleased to read about the consequences of them! I agree, Jo. I was quite alarmed to find out their significance. Shame that such beauty it a portent of something far more malevolent. Very true – nature has wonderful ways of warning us! What a spectacle! Sad to think that’s the ozone layer being destroyed. A beautiful death. I know, Pat, I was dismayed to find that out. I believe they are also doing tests to see if noctilucent clouds are linked in the same way. They look amazing and thanks for the explanation too! Glad you saw them too! Lovecraft – don’t know that one – folk tales? Early 20th century, deeply weird and literary horror and dark fantasy. He’s the creator of the Cthulhu mythos and the Necrinomicon, so his work has actually entered modern folklore. Thanks for that! Cthulu rings a bell somewhere. Yes, we had a lot on Monday, and one again this afternoon. I took some photos on the phone, but they didn’t come out too well, glad yours have….beautiful but deadly. Thanks, Lynne! Having tried a few times the day before, we were more ready for them the 3rd time! Fascinating. Clouds are such beautiful and varied things. Lenticular clouds are quite common down here but I never seem to have my camera with me when I see one. I know – usually it’s a case of not being quick enough, but these stayed around for at least an hour. I still can’t believe we saw them (plenty of others did too, going by Twitter etc!) Love lenticular clouds, especially because they usually happen in fine weather (I think!) Dreaming of fine weather at present! Sweet dreams. Hope they come true soon.